The McDonald’s Hispanic Owner-Operators Association (MHOA) is proud to have participated once again in Fiesta del Sol, the largest Latino festival in the Midwest! Thanks to the MHOA attendees had the opportunity to play in a variety of games, receive prizes, free samples of the McCafe Mocha Frappe and coupons for the New Bacon Clubhouse Burger, the new Jalape–o Double, desserts and McCafe products. 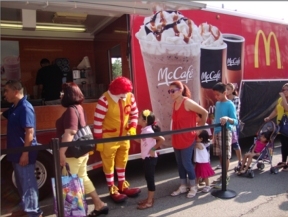 Ronald McDonald greeted everyone from the stage and interacted with visitors to the McDonald’s area.